We have been given a gift with this drought. With our own eyes and in our own gardens, we can see which plants truly do well in a drought and which plants melt or shrivel up in the heat when we go a few days, or months, without rain. Sure, we could have skipped the whole drought experience and just googled "drought tolerant plants" and memorized lists of plants that others said were drought tolerant. Or checked in the dozens of books about plants that we no doubt have collecting dust on our bookshelves. But knowledge gained by memorizing is quickly forgotten. Knowledge gained by experience stays with us forever. Forever, I will remember how the Hosta and Epimedium in the garden border I call Bird's Blanket just shriveled up in the heat no matter how much I watered them. I will remember, fondly, how the variegated Lioripe and the hardy ground orchid, Bletilla, looked pretty decent in spite of the drought. In this fifth step of drought recovery, we need to use our experience supplemented by some research to choose new plants for our gardens that don't go all prissy on us and demand water the minute we go two days without rain. If you like and are a bit indecisive, you can also have a category somewhere in between good and bad for those plants that didn't look good but didn't look bad and might make it through the drought in other years. With our new knowledge of which plants truly have what it takes to survive a drought, and a better understanding of other plants' needs, we now can choose plants more wisely for our gardens for future years. 3) Make a quick hit task list. 4) Freshen up your garden. 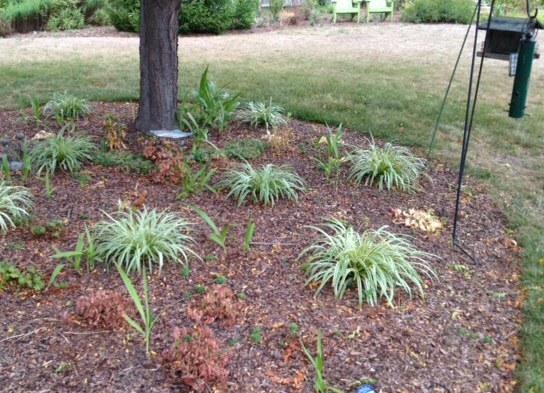 Since I started this gardener's guide to drought recovery, I must confess that we've had some rain, so I feel like the drought is loosening its grip, ever so slightly. Rain, as it turns out, is very helpful in drought recovery. We are finally getting some rain too! Such a relief! Just a few drops can totally change the mental outlook. There is promise! You and I are supposed to have rain this afternoon! Enjoy! I will make my list before today's rain comes in. What do I do with the plants that look dead? leave them and hope for the best? go ahead and pull them up and compost them? or dig them up and pot the roots and baby them, hoping for a recovery? Hi There, I'm a Brit living in southern California so your articles about drought recovery resonate with me a lot. Where I live (near San Diego) we get about 9" of rain a year, which is way less than you guys would, even in drought conditions. My suggestions would be to look to the Mediterranean climates for ideas of great drought tolerant plants. You can also make sure you mulch well with wood chip or compost or leaf mould. Just need to check the cold temperature limits with these plants - it very rarely gets to freezing here.